How to Install a Fiber Optic Modem? Why is Multiplexing Needed in Data Communication Systems? What is Concept of Multiplexing in Telephone System? What is Digital TV Frequency? How to Activate Cable Modems? How do I Choose a Best Fiber Modem? Multiplexers can be used to connect PBX, Hot line and other devices of network from central site to user site through fiber optical cable. Hook up the modem with the female DB25 connector found on the device that will be used to run the modem. If the power is not furnished via the DB25 connector, then proceed to Step 2. If it is provided through the DB25 connector, then move on to Step 3. Insert a wall power supply into the nearest wall outlet. Join the plug attached to the end of your power supply's wire with the modem's power input port. You'll find this port adjacent to the fiber connectors. Take the dust caps off the connector. You'll find these on the end of the optical fiber that is installed. Remove the modem's dust caps from its optical output ports. Link the fiber cable to the optical ports by fitting the tip of each optical "ST" connector with a jack. Line up the key on the sleeve, hold in the collar and turn clockwise until it locks. Perform these same steps with the other fiber optic modems. The "Tx" port on one of the modem's has to be joined via fiber with the "RX" port on the other. 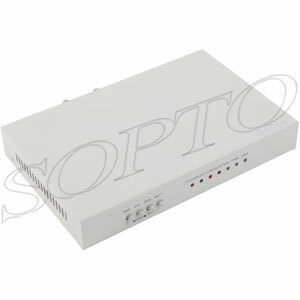 Sopto Supply high quality fiber optic modems with reasonable price. For the newest quotes, please contact a Sopto representative by calling 86-755-36946668, or by sending an email to info@sopto.com. For more info, please browse our website.